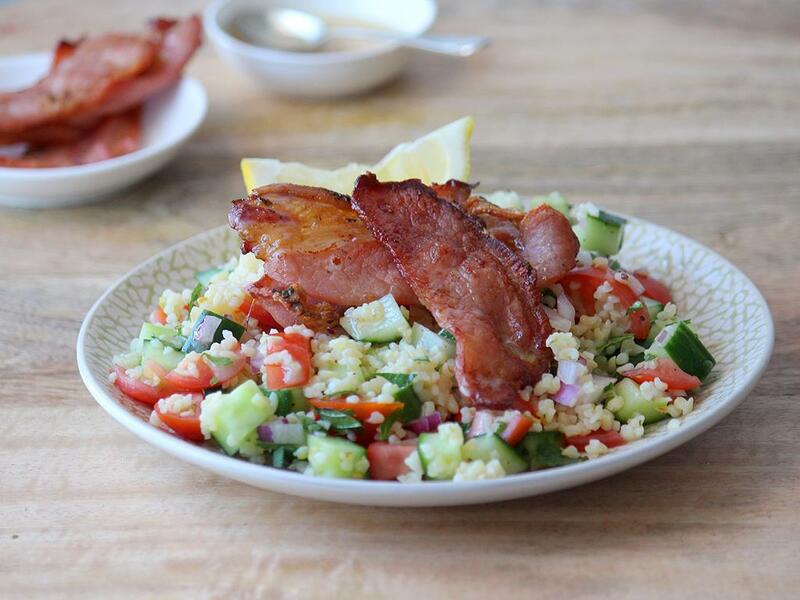 Bulgur with tomato, cucumber, fresh herbs & honey mustard dressing, served with crispy bacon. Lemon: Using the fine side of a box grater, grate the peel to create zest, then cut into wedges. Diced cucumber: Trim the ends, slice in half lengthways and scrape out the seeds with a teaspoon. Then dice the cucumber into 1cm cubes. Bulgur wheat: Place a pot on medium-high heat and add boiling water (2 cups for 4; 1 cup for 2). Add the wheat and boil gently for 10 minutes until tender. Drain, season and leave to cool down slightly. Bulgur salad: Mix together the bulgur wheat, cucumber, tomatoes, red onion, fresh mint and parsley. Add the lemon zest, a squeeze of juice and dress with the mustard glaze (add to your preference). Season with salt and pepper. 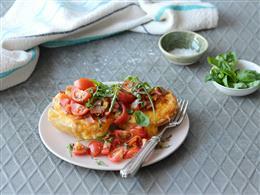 Homestyle bacon: Place a dry pan on medium-high heat (add a drizzle of olive oil if you prefer or use a non-stick pan). 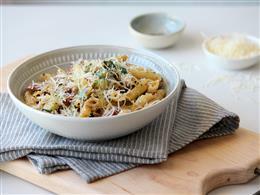 When hot, add the bacon and fry for 2 minutes a side until golden and crispy. Remove onto paper towels. Serve the bulgur salad topped with the crispy bacon.